Skinny vs. Fit - is there really that big of a difference? Yes! As a woman who has decreased her body fat percentage by more than 10%, all while maintaining a similar body weight, I can tell you this: being "fit" has changed my life both physically and mentally. It has also motivated me to become a Certified Personal Trainer and Nutrition Coach to empower positive change in others. Continue reading to learn what inspired me to get fit, 4 Ways being fit has reshaped my life, and the biggest difference between skinny vs. fit. What Inspired Me to Get Fit? Before becoming a Personal Trainer, I was working in financial services. Dressed in a pretty gray lace top, matching gray pants, and this awesome pair of silver heels, I walked past the windows of a downtown storefront and saw my reflection. My shoulders were starting to slope downward. My stomach jutted forward. As a person who has always prided themselves in having good posture, I was mortified. Sure, I knew this was due to the start of the aging process and that, naturally, I was maintaining less and less muscle, but I didn't like what I saw. During that time, I took the Milwaukee lakefront to get to and from work. On the way home, during warmer months, I would see people - of all shapes and sizes! - running the lakefront trail. They made it look so easy and I couldn't even run a single mile....not even 1/2 a mile...not even 90 seconds. I was envious that they could and I “could not." 1. "Fit" Karen Runs Marathons. Remember when I used to envy the runners down by the lakefront? These days, I'm finishing marathons. Rather than uttering "I can't" when running, I use each run to clear my head and process what is going on in my life. Running is “me” time and I have a much better handle on life (and the world in general!) since getting fit. Additionally, there is this theory that our exercise should address both our “flight and fight” systems. So, while running adequately trains my flight mechanism, I also use strength and interval training to practice my “fight.” There really isn’t anything quite as satisfying as beating the hell out of a punching bag when you are stressed, or cranking out dozens of burpees when you didn’t even feel like doing one. 2. Physically, There is No Comparison. "Skinny" Karen weighed 131 pounds and had a body fat percentage of 27.5%. "Fit" Karen weighs anywhere from 135-140 lbs. and has a body fat percentage of 18-20%. I can run for over 4 hours at a time and still have energy to attend a Packer game. I can do full push-ups with perfect form. I can also do a roundhouse kick over my head, get lost on steep mountains in Montana, and protect myself in a dark alley if ever put in that situation. Notice all of the "I can's" in there? 3. I've Raised Over $40,000 for Cancer Research. People might not realize it, but maintaining a healthy lifestyle and strong body isn't always easy. I still struggle with the same challenges and temptations that everyone else does. And, I still need to give myself a huge pep talk before a 17 mile run. So, what keeps me moving forward and staying fit? My family. They are my incentive. Over the years, we’ve been hit really hard by cancer. I don’t want anyone in my inner circle worrying about me getting sick or having another family health situation that could have been prevented. 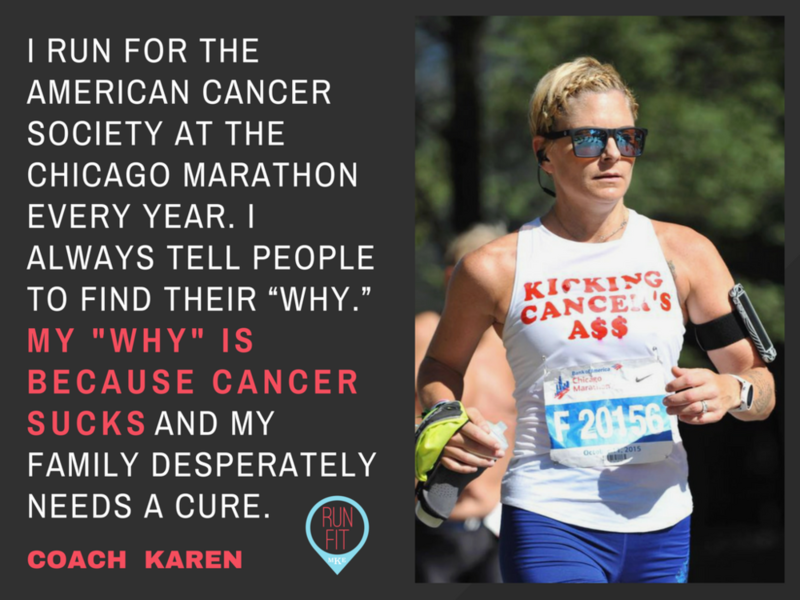 It's also because my family desperately needs a cure for cancer that I've raised more than $40,000 for the American Cancer Society by running marathons as part of their team. Certainly, this helps with being fit, too. 4. I'm Building Others Up. It took a lot of work to become a Certified Personal Trainer and Nutrition Coach - but, I was and remain determined to build others up. I know "I can" inspire change. I know "I can" help people strengthen their bodies and their minds through a customized training program. 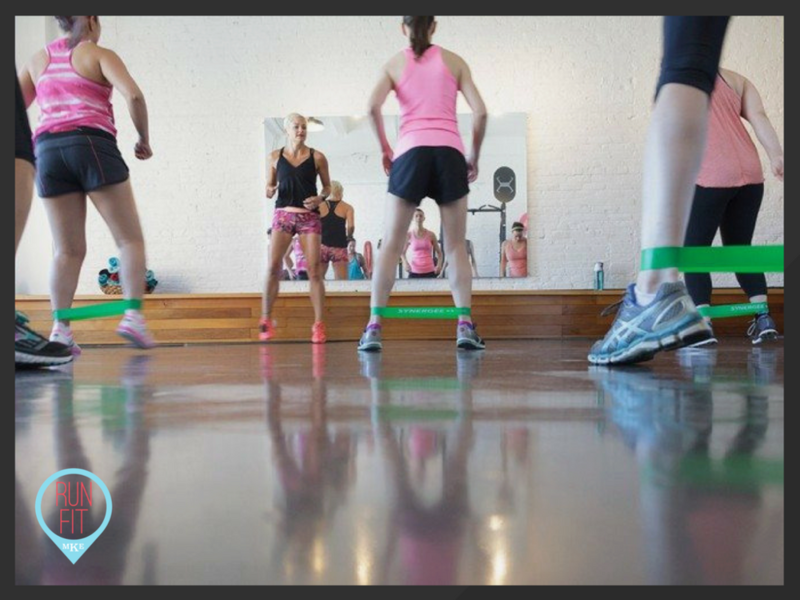 Since starting RunFit MKE, I've witnessed so many of my clients achieve a healthier, happier self. "I am stronger, my endurance is increasing every day, and I feel so good! Taking a "whole body" approach, with measurements and body fat percentage and not just focusing on the numbers on the scale has been eye-opening and rewarding! Karen challenges and encourages me to go beyond what I think I can. She is a true gem." what's the biggest difference between skinny vs. fit? Being fit means you are taking care of your body - achieving true health - it's not just a scale number or a jeans size. Fit means warding off diabetes, cancer, heart disease, obesity, and other diseases that will limit the time you will have to spend with the ones you love. We have exactly one life to live. Exactly one. And we don’t have any idea when our number will be called. But, I guarantee you that being fit will help ensure your ticket doesn’t get punched before it is due. If you'd like to understand more about the differences in Skinny vs. Fit and go beyond what you think you can, I'll get you there. I'll happily offer a complimentary one-on-one consultation that will provide a comprehensive look at the current state of your health, physical abilities, nutritional practices, social support, and readiness for change. Click here to for your FREE one-on-one consultation.